Velero [Sp. 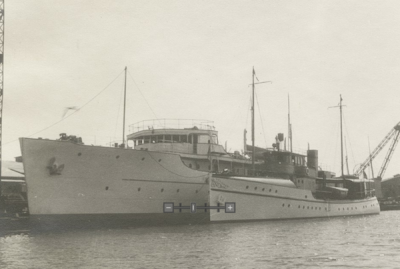 sailor], a series of research vessels designed and built for G. Allan Hancock, and his namesake foundation at the University of Southern California, each more advanced than the other, and every one a craft more fully equipped for marine scientific investigation. Pioneering oceanographic research was conducted in the eastern Pacific waters, equatorial islands and portions of the Caribbean. Velero (#212324) (1914- ), Hancock’s first vessel, was later stretched from 78 to 99 feet by cutting her in half and adding 21 feet. Her home port was Los Angeles. Hancock took Velero on a several month-long voyage around the Baja peninsula and coast of Mexico. The trip was not for scientific purposes. Velero II (# ) was built after World War I in 1922. She was 125 feet in length, and at the time was the only diesel electric-driven cruiser on the Pacific coast. Velero II was taken as far south as Panama with an amateur marine biologist who deepened Hancock's interest in scientific voyages. George Hugh Banning, a guest aboard acting as second mate, dedicated his book, In Mexican Waters (1925), to "Capt. G. Allan Hancock Master of the Velero II . 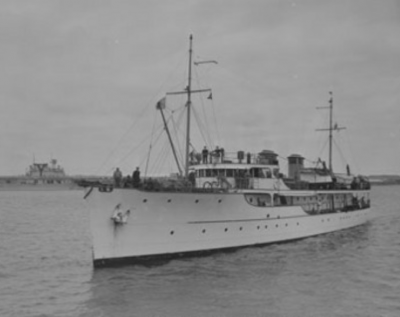 Oaxaca (# ) was a vessel Hancock purchased from the British Admiralty and captained following Velero II. 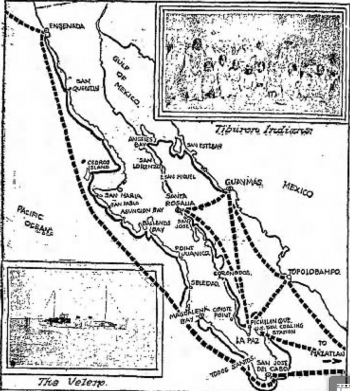 Oaxaca carried a crew of thirty-five men and twelve scientists, including representatives of the California Academy of Sciences, on a voyage as far as the Galapagos Islands in 1927. Velero III (#230891) (1931- ) was designed by naval architect G. Bruce Newby at Hancock's instruction to both appear and perform in a similar manner to the new United States Coast Guard cutters being built on the Pacific Coast. Velero III launched at Craig Shipbuilding in Long Beach on April 2, 1931. She was 198 feet long with a 30-foot beam, and with her twin Winston diesel engines, she had a cruising range of 10,000 miles without refueling. Velero III made extensive investigations around the California Channel Islands, which resulted in specimen collections and a number of publications. In 1939, Hancock founded the Allan Hancock Foundation, and he gave the Velero III to the Foundation, followed by several other vessels. Hancock was a donor to the University of Southern California with Velero III eventually becoming R/V Velero III in research associated with the university and a sculpture of the vessel appears on the Hancock Institute for Marine Studies at U.S.C. From 1931 until 1941, during ten expeditions of several months each, the vessel's collection efforts were largely in marine invertebrate zoology between San Francisco and Peru and at the end equaled or surpassed collection efforts in that field by previous ships with Hancock Hall at the University being built as a repository for the collection and data. The ship served the foundation for ten years before she was purchased for war use by the Navy on December 15, 1941, being commissioned as the USS Chalcedony, designated PYC-16 on weather duty for the Hawaiian Sea Frontier. 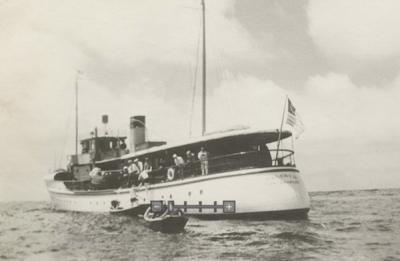 In 1947 the vessel was being operated as the yacht Velero III for Nicholas A. Kessler and in 1948 was registered to Independent Tankships as the yacht Ahmady with the home port of Wilmington, Delaware. In 1949, Velero III was sold to the ruler of Kuwait. Velero IV (#255750) (1948+), a 110-foot long, 298-gross-ton single screw vessel of tuna clipper hull design, with a 28-foot beam, launched at National Iron Works, San Diego with dignitaries of the University of Southern California, the Foundation, Navy and science participating. 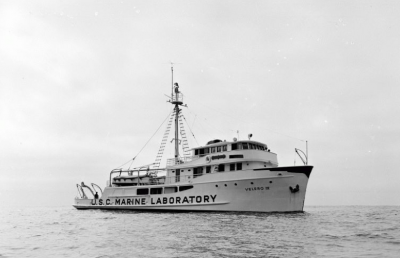 She was built as the last in a series of vessels owned by Captain G. Allen Hancock, this one to serve as a marine laboratory for the University of Southern California. At her launching she carried a 600-h.p. engine and was registered to the University of Southern California. This vessel had a larger capacity and more sophisticated gear for scientific voyages. 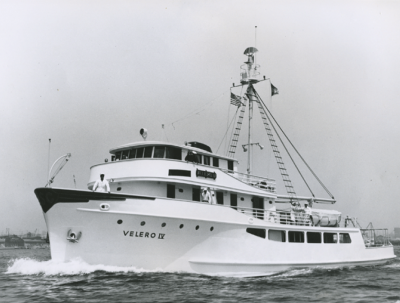 Velero IV served the foundation after World War II and facilitated additional collections on the California Channel Islands. Jacques Courteau tested skindiving equipment during his excursions on board. Dr. Otis Barton made the record dive in his benthoscope to 4500 feet off the vessel. His record still stands as the deepest dive by a connected submersible. Velero IV was sold by USC in the 1980s and is still active as of 2016 operating out of Seattle as a fishing support vessel. “San Clemente Island is the southernmost of the group, directly south of Santa Catalina Island, 19 miles away, and 60 miles from the mainland coast at La Jolla. It is almost as long as Santa Catalina Island, but it has an average width of only 2% miles. The northwest half of the island has much more regular surface than is ordinarily found in these islands, but the remainder of the island is more corrugated. The northeast side is rocky and abrupt, but the southwest side is much less so, the sea slope here being correspondingly more gradual. There is much less kelp around the shores than around San Nicolas or Santa Barbara. There are three harbors near the north end — West Cove, Northwest Harbor, and Wilson Cove — and Pyramid Cove at the south end. Dunkle, M. B. Plant Ecology of the Channel Islands of California in Allan Hancock Pacific Expeditions 13: 3, 1950. 1935: Expedition to bring two Northern Elephant Seals from Guadalupe Island, Mexico to the San Diego Zoo. “A Trip to Guadalupe. A long hoped for voyage of discovery was carried out during the last part of September by the Zoological Society of San Diego. Commander Bowdey of the 11th Naval District, who has contributed much valuable service to our work during the three years that he has been stationed in San Diego, succeeded in interesting Captain Allan Hancock of Los Angeles in the investigation that the society had been hoping to make at the Guadalupe Island. The main object of the trip was to attempt to locate the reported hiding place of the Guadalupe Fur Seal, (Arctocephalus townsendii), which had made its appearance again in 1927 after nearly forty years of oblivion. The yacht Velero II, belonging to Captain Hancock is admirably fitted for such a purpose, for Captain Hancock is himself a sportsman, and a naturalist as well as a seaman. He is well known in scientific circles as the man who made the Brea pits in Los Angeles possible and who has by protecting and setting aside this valuable scientific bonanza contributed greatly to historic knowledge of zoology. He was therefore interested personally in helping to establish facts in connection with this, the most interesting of sea mammals. The Zoological Society has long been convinced that if there were any considerable number of they had a hiding place which would well be nigh impossible to locate except through chance or by the assistance of someone who had previous knowledge of the location. Upon reaching the island repeated trips up and down the coast where the old seal herds used to roam were made and all possible sites of the hiding place carefully studies. After landing several times and investigating carefully the possible chances for hidden caves, Commander Bowdey was confident that such a cave as we were seeking could be in the spot selected by the informer. It is perfectly concealed, as Doctor Townsend, who had searched the same coast, had predicted it would be, and is located near enough to their old haunts to be a very plausible location. Many pictures were taken by those aboard the ship and we feel that with this evidence and the careful marking of a chart of the island by the commander that the spot will easily be determined at any time. Neither the persons familiar with the habits of the seal nor those responsible for the expedition had any real hopes of seeing specimens of the seal at the island during the month of September. Although very little is actually known of the habits of the former numerous herds, records show that no skins were brought in later than September first or before the first of June, but there is no knowledge of the migratory habits of the animal further than the deductions to be made from these records. After locating the fur seal caves a cruise around the island for further study was made to investigate the condition of the Elephant Seal and to verify reports of white seals on one of the outer islands. Lying just south of the main island this series of smaller volcanic peaks present a forbidding appearance. Upon first approach they would seem to be entirely bare of plant or animal life, but closer views show that in every crevice of the cliffs in which soil could form or collect, some plant has taken root. Sea birds have made resting places and probably nesting places on some of the sheltered crevices or slopes, and on a steep sloping shelf running straight from the water's edge on the southwest cliff of the southern islet, a group of sea lions had established themselves. Among them were ten or more pure white seal, while scattered among the regularly colored sea lions were as many more light colored or spotted ones. These white seal were indeed an exciting vision, and to the mind of every member of the expedition came the story Rudyard Kipling wrote of the white seal of Pribiloff. To protect themselves from harm these animals had used their instinctive wisdom for nothing could approach very close to them except by sea; at the first warning most of them slid off into water hundreds of fathoms deep and rough enough to insure them comparative safety from everything except bullets. There is no possible landing place on the island so approach from that angle is no menace. While Captain Hancock went as close to the cliff as it was possible the light was too poor to make long distance pictures of any value, so although both still and motion pictures were taken, the results were entirely negative. This is one of the things which is calling us back to the island; the hope of getting at least distinct pictures of these beautiful creatures. There is no doubt of the writer that these are albino sea lion and not merely some of which have become bleached by the sun's rays. All of the seal on the cliff were not white, nor even light. Those that were white were in marked contrast to the others, even the buff colored ones which were scattered indiscriminately among them. When these light seal went into the water they looked almost brown so long as they were wet; not so the white ones. They were just as snowy in the water as when we saw them apparently perfectly dry upon the rocks. They have been reported there for several years always among the natural colored ones, and the ledge is not exposed to the sun's rays for very long periods because of the curve in the contour of the island which shelters its mornings and evenings. Neither would they be more exposed than on the ordinary rookeries. While there were no white seal pups in evidence, it is a logical conclusion that the white seal are albino sea lions which are to a certain extent breeding true. While it could not be stated as a positive fact, one of the seal lying close to the water's edge had every appearance of the fur seal which we were searching for; the thick round body and the sharp nose looked very like the two specimens formerly on exhibit in the garden. One maverick fur seal in a herd of sea lions would not be impossible. The elephant seal beach was reached in the early morning. If it had not been for Commander Bowdey this would have been passed by without recognition. That the beach was thickly populated with its giant inhabitants was evident from the yacht seen with the naked eye. Through the powerful glasses several partial counts were made and Commander Bowdey was convinced that no less than five hundred elephants were on the beach, with a much greater percentage of adult males than he had ever seen before. Doctor McLeish was not satisfied to view them from the distance, and taking a skiff with first mate Johnson rowed to the last line of breakers. He spent an hour or more in close observation and counted many of the larger groups. He also counted many in the breakers that could not be seen from the yacht. The Doctor said that five hundred was a most conservative estimate. This would indicate that the herd of immense pinnipeds is steadily increasing and the increase in adult bulls leads to the conclusion that at the time of the society's expedition a year ago the big fellows were away on a fall hunting trip or whatever mysterious business calls the sea mammals on their annual pilgrimage. The Zoological Society is greatly indebted to Captain Hancock not only for the generous use of his yacht but for the real interest he showed in the work and the personal effort he made to make every part of the trip a success. The real result of the work will not be entirely known until the society makes a trip in the late spring after fur seals and possibly white ones. Then the value of the information which we have gathered will be proven and perhaps some more added to the meager facts which have so long been all that has been actually known of one of the most valuable and rarest zoological specimens in the world, the Guadalupe Fur Seal. We certainly hope that the sequel to this expedition will make Captain Hancock feel repaid for the expense and trouble to which he has been out. November 8, 1941: “The first contingent of the Museum party left Terminal Island at 8:00 A.M. November 8, 1941, sailing on the Velero III, as guests of Captain Allan Hancock. The museum group consisted of Kenneth Stager, mammalogist and ornithologist; Mrs. Stager, as field assistant to her husband, and camp cook; King A. Richey, paleontologist; Harry Fletcher and John C. Stock, assistant paleontologists, and the writer [John A. Comstock], as coordinator. Anchorage was made in Becher’s Bay just before dusk, in a high wind. Landing dunnage and camp supplies proved difficult, but was finally completed without mishap. Mr. N. R. Vail furnished a tractor and trailer to move the equipment and supplies from the pier to a cabin which was generously placed at the disposal of the Survey party. Mr. Vail and the ranch foreman, Mr. George Haise, were very helpful in organizing facilities for the convenience and comfort of our group…” [LACM Expedition #13.] 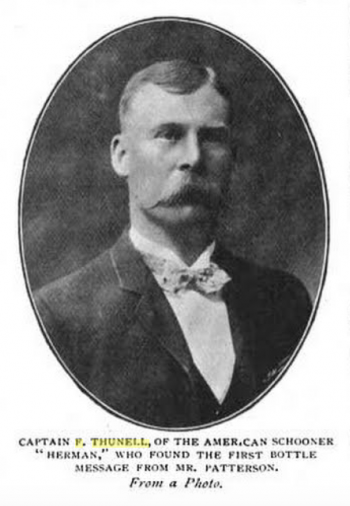 Comstock, John A. Brief notes on the expeditions conducted between March 16, 1940 and December 14, 1941 in Contributions from the Los Angeles Museum Channel Islands Biological Survey. Bulletin of the So. Cal. Acad. Sciences XLV, May-August, 1946, Part 2. This page was last edited on 27 August 2018, at 07:18.